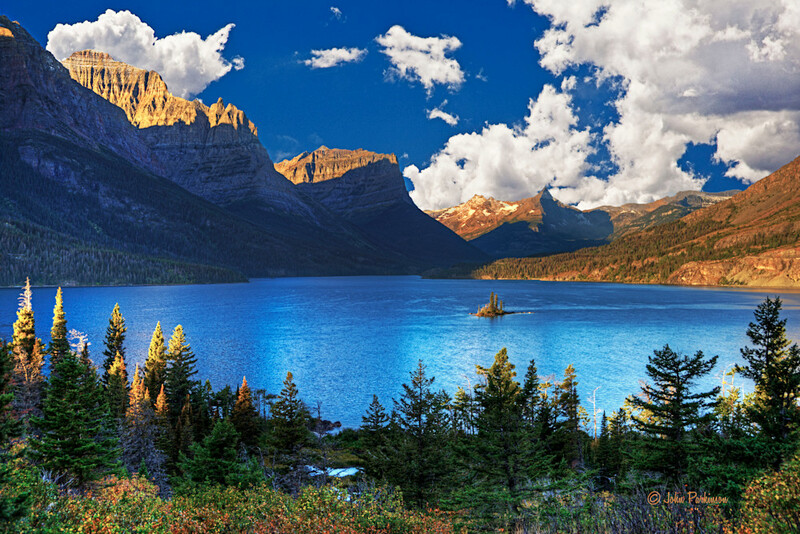 Saint Mary Lake, at 9.9 miles long and 300 feet deep, is the second-largest lake in Glacier National Park, Montana. Lake McDonald, located on the west side of the continental divide is the largest. The Going-to-the-Sun road parallels Saint Mary Lake along its north slope. At an altitude of 4,484 feet, the lake's waters rarely rise above 50 degrees and are home to various species of trout. During winter, the lake is completely frozen over with ice up to four feet thick. The mountains that cradle Saint Mary Lake soar more than 4,000 feet above the waters edge but, however impressive, Wild Goose Island is the center piece of this image created shortly after sunrise.